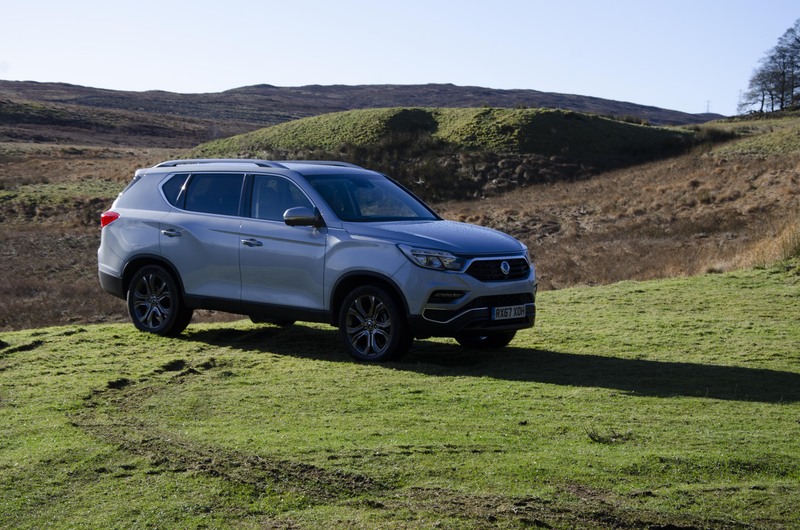 Revealed at the 89th Geneva Motor Show, the all-new SsangYong Korando looks set to take the small SUV sector by the scruff of the neck. 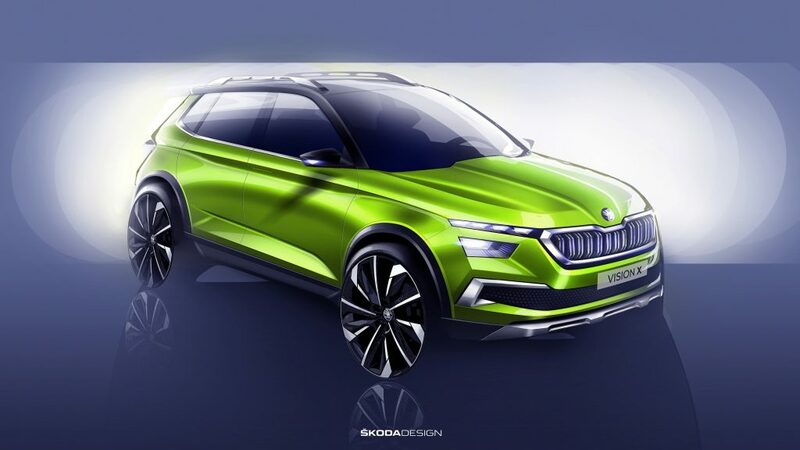 It will come to market with a healthy spec list, a new 1.5-litre petrol engine, and updated version of the old 1.6 diesel and there will be an EV to follow. 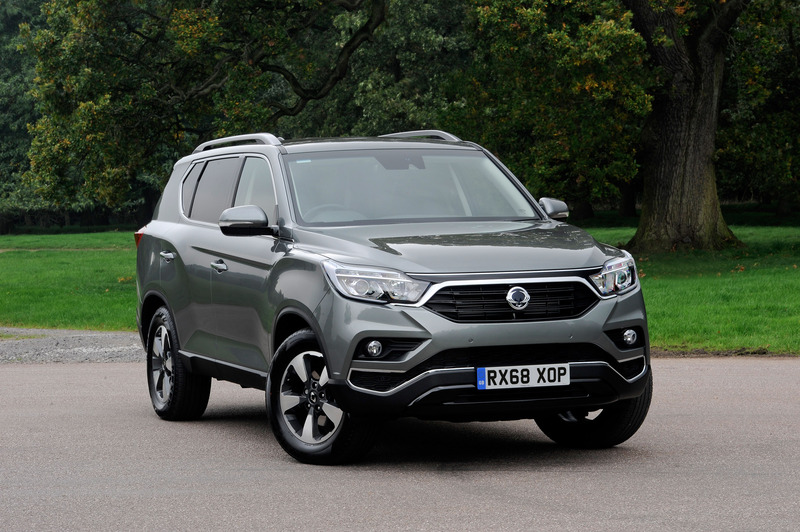 There has also been some restyling, with a new headlight and grille design to help it fit in with the current SsangYong family. The new model is wider, longer and sits shorter on a longer wheelbase than the previous model. 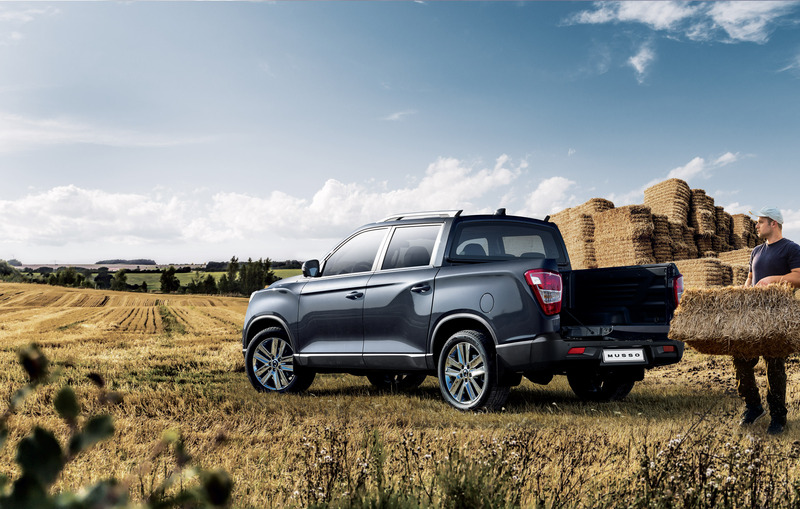 This translates into a spacious cabin and storage space of up to 1,248-litres, plus a boot space measuring 551-litres whilst seating five. 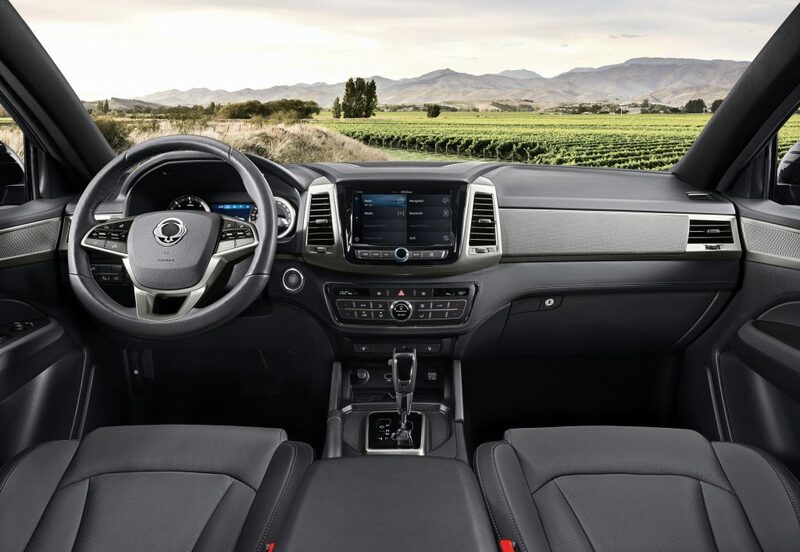 Inside, the re-designed interior is contemporary and offers plenty of tech as standard. 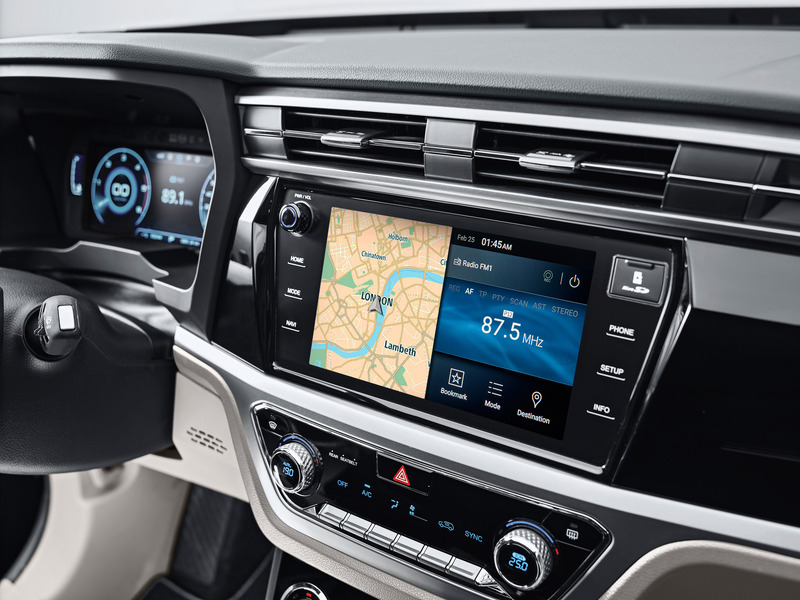 Both Apple CarPlay and Android Auto come fresh off the shelf, as does the 9″ infotainment touchscreen and 10.25″ LCD driver displays. 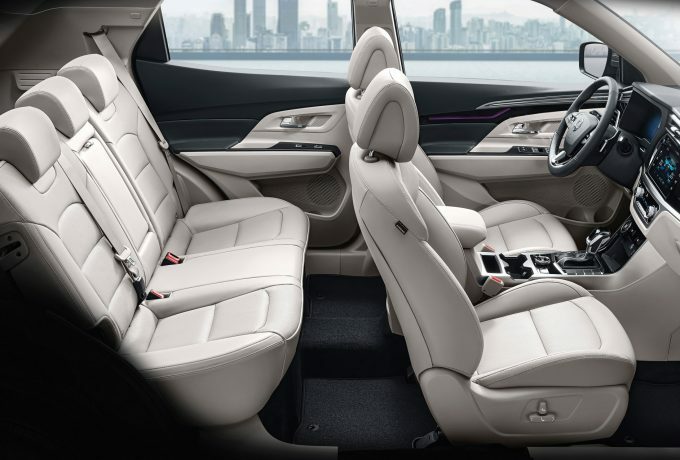 Seating in the front is adjustable four-ways, with lumbar support, whilst the interior is also kitted out with ambient lighting – the colour of which is changeable (maybe don’t tell the kids about that one). 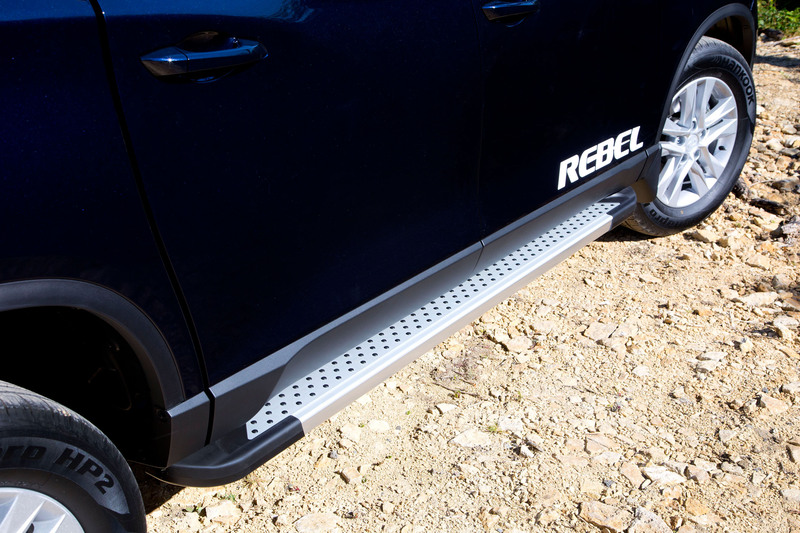 The door sills are designed to cover the lowest point possible, so that external dirt isn’t picked up and brought inside whilst climbing aboard. Safety systems to assist Korando drivers include advanced emergency braking, lane keeping assist, safe distance and driver alerts, plus adaptive cruise control, high beam assistance, blind spot monitoring and rear traffic cross alert. 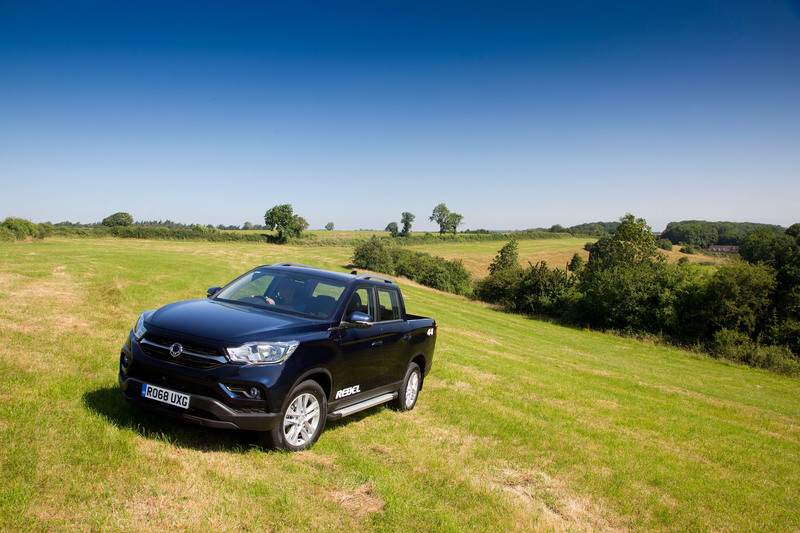 The new 1.5-litre GDI-turbo petrol unit has 163bhp at its disposal along with 207lbf.ft. The updated 1.6-litre diesel kicks out 136bhp and 239lbf.ft as low as 1,500rpm. 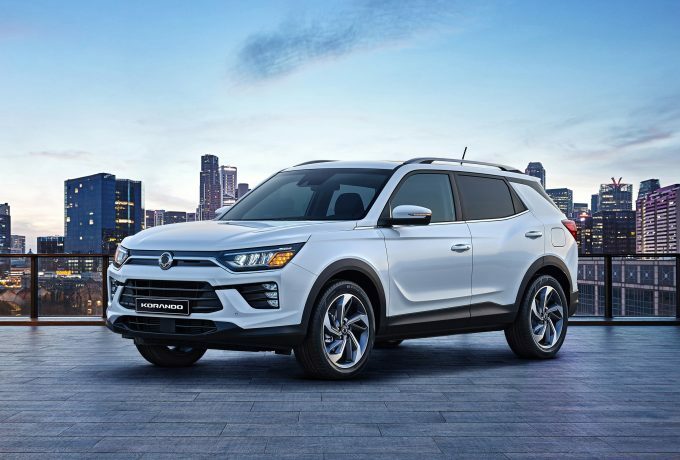 Both units will comes with stop/start abilities on two-wheel drive models and there will also be a choice of automatic or manual six-speed transmissions. 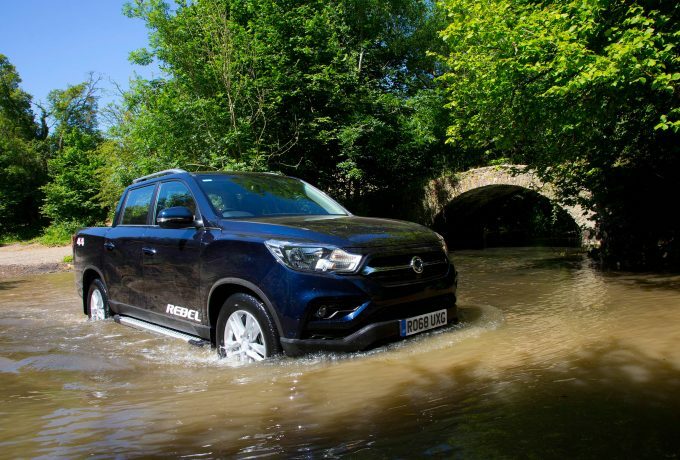 There’s no official pricing yet, but when the new Korando goes on sale in Europe later in the year, SsangYong say that it will offer sector best value for money. 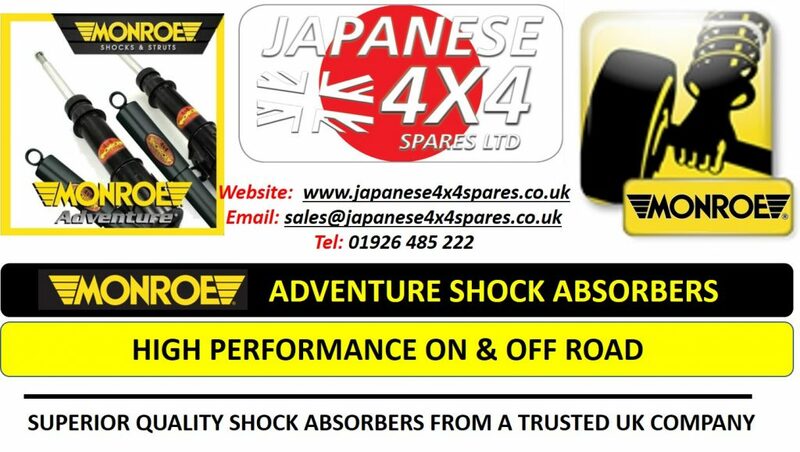 On previous form, there’s no reason to doubt this. 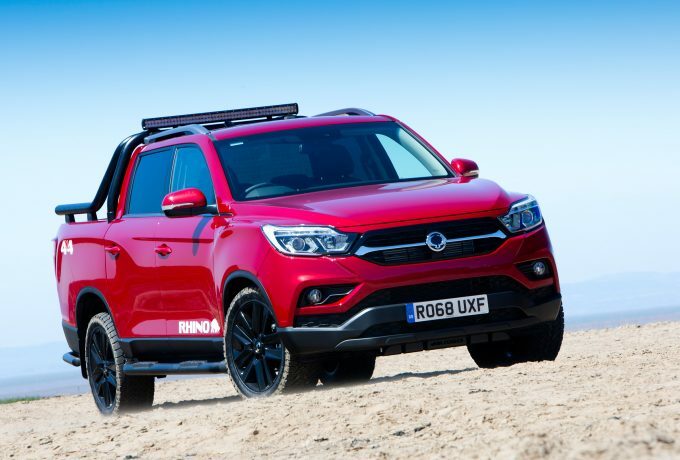 Ahead of making its full debut at the Geneva Motor Show, SsangYong have teased us with a first look at their new, fourth-generation Korando. 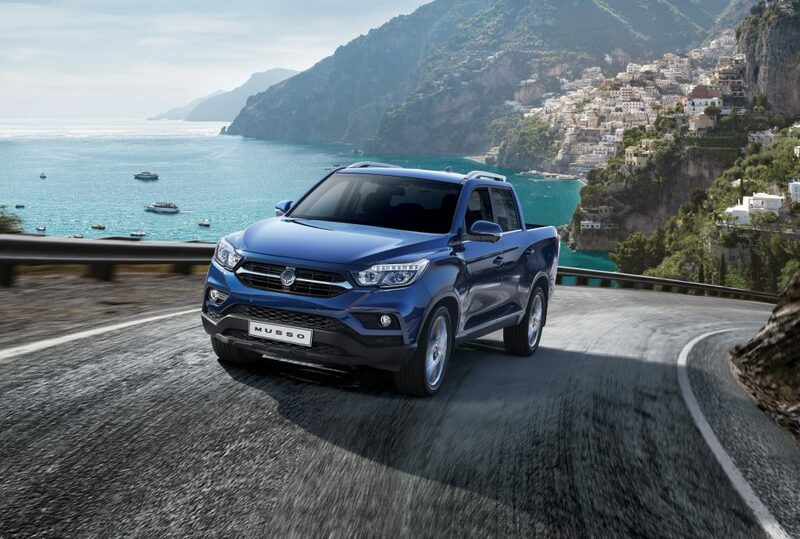 Whilst full details haven’t been disclosed, we do know that the new model has been redesigned – and to good effect to our eyes. 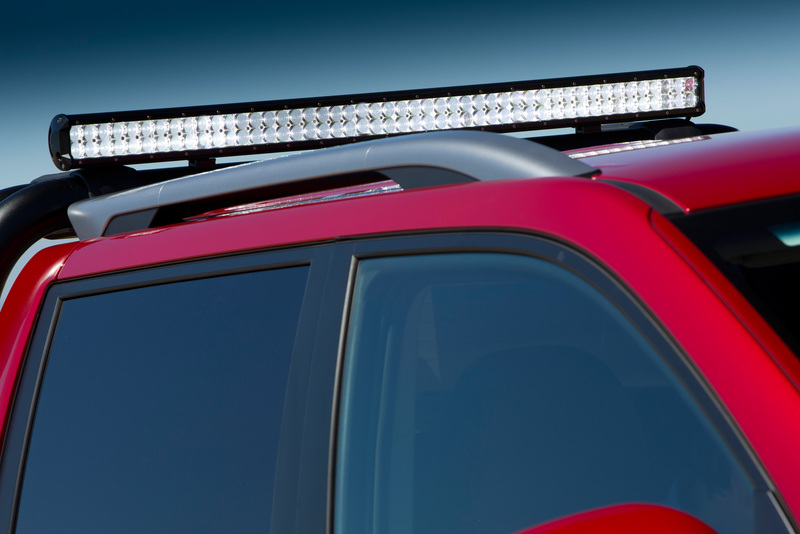 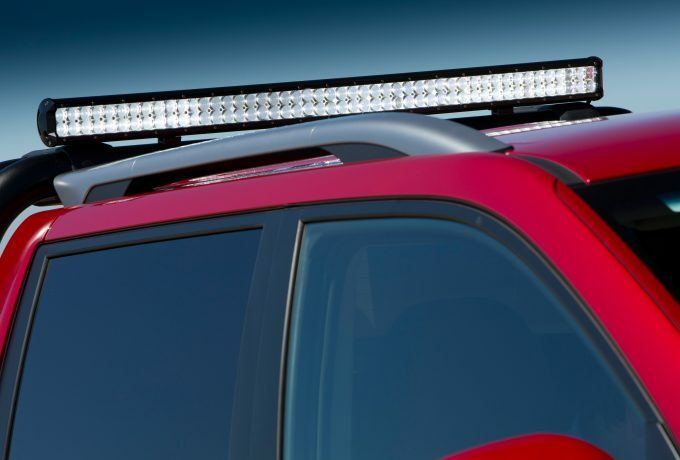 The headliners of the new look are the headlights and the new grille, which give the little SUV a look of purpose. 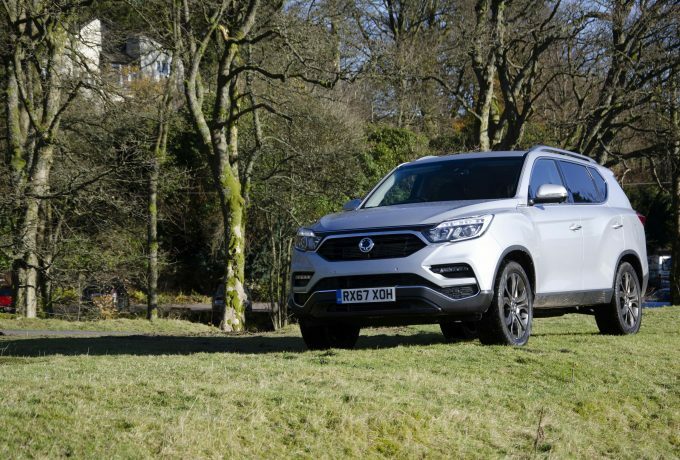 SsangYong have paired this with a refined interior and added enhanced driver assistance, safety systems and mobile connectivity. 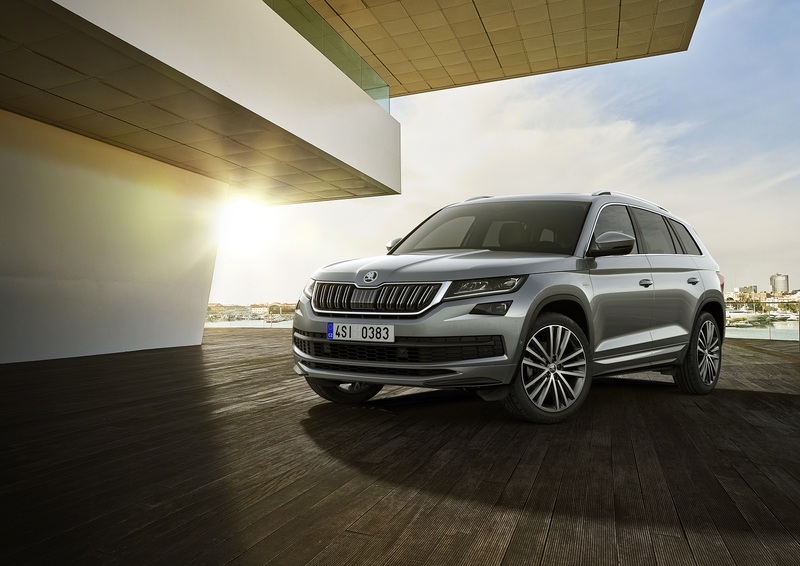 Seating will be four-way adjustable, and there will be a 9″ infotainment screen and a 10.25″ full colour LCD cluster that can also accommodate navigation instructions. 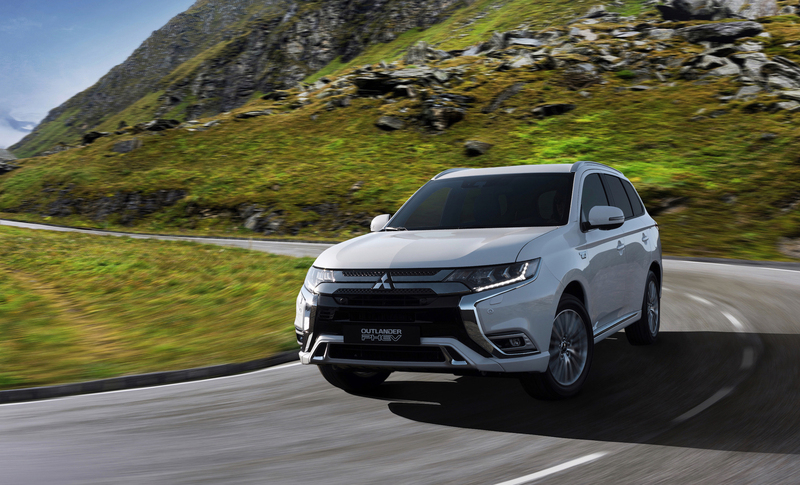 Powering the new model will be a 1.5-litre turbocharged petrol and an update on the 1.6 diesel equivalent at launch – with an EV to follow. 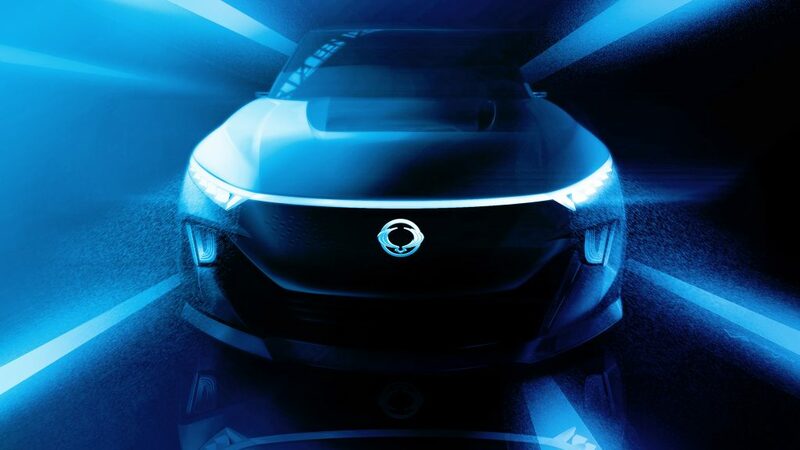 Further details will become apparent after the big reveal at the Geneva Motor Show. 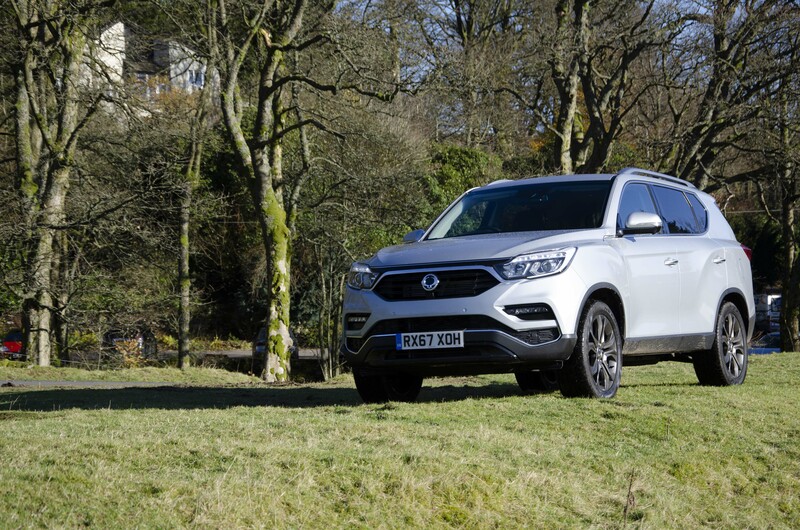 SsangYong have refreshed the Turismo MPV, with a fresh face, their capable 2.2 diesel and a four-wheel drive option with low-range, plus a new touchscreen infotainment system. 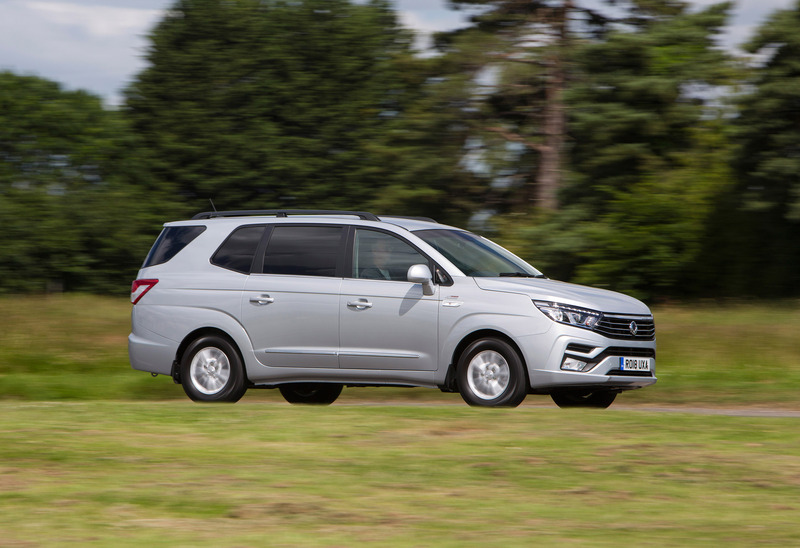 The massive MPV has a wheelbase of three-metres and a total length of just over five. The range topping ELX variant receives selectable four-wheel drive and a Merc derived seven-speed automatic transmission. 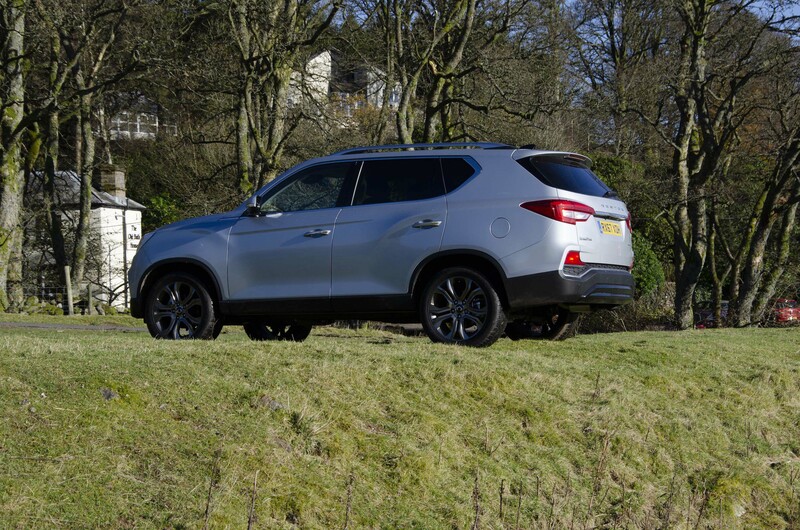 Blackout rear passenger privacy windows feature on the range topper, as do cruise control, parking sensors, 16″ alloys, heated front seats, rain sensing wipers and automatic headlights. 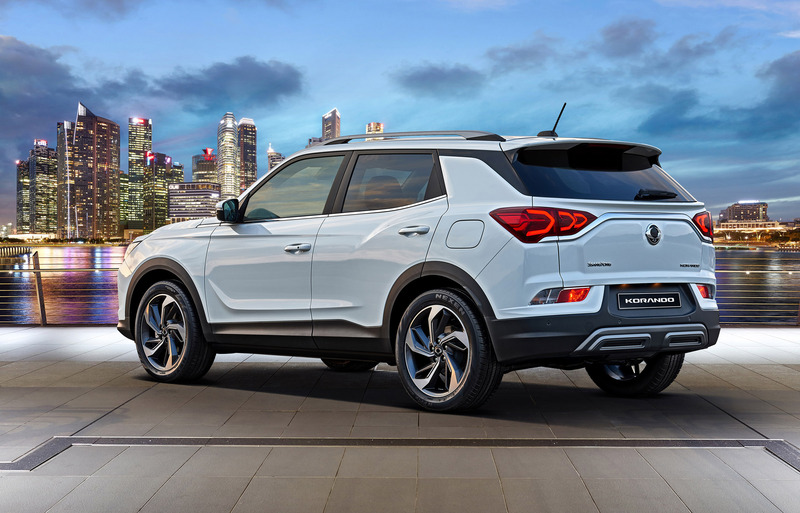 SsangYong’s latest infotainment system has also been introduced, bringing Apple CarPlay and Android Auto to the fore, plus DAB radio and a reversing camera. Due to the immense size and length of the MPV there’s room for seven to sit in total comfort and space aplenty for their luggage, too. 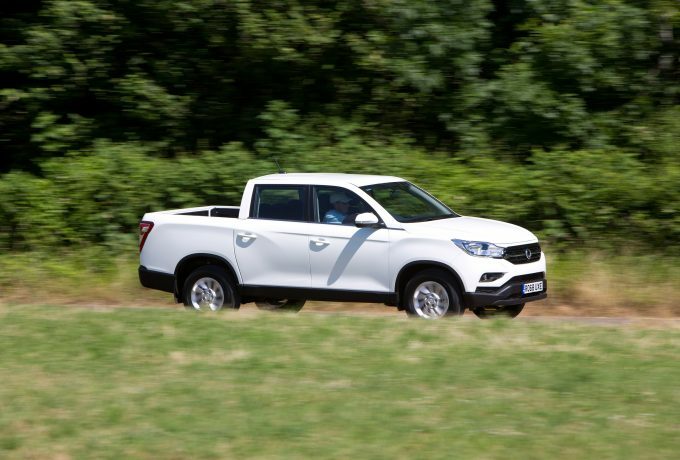 Rear load space ranges from 875-litres with seven adults on board, to 3,146-litres with two adults when the second row of seats is flat and the third removed – ideal for proverbial sink-packers. A two-tonne towing capacity extends the Turismo ELX’s practicality further, and the double wishbone front and multi-link rear suspension setup keeps it planted and comfortable. 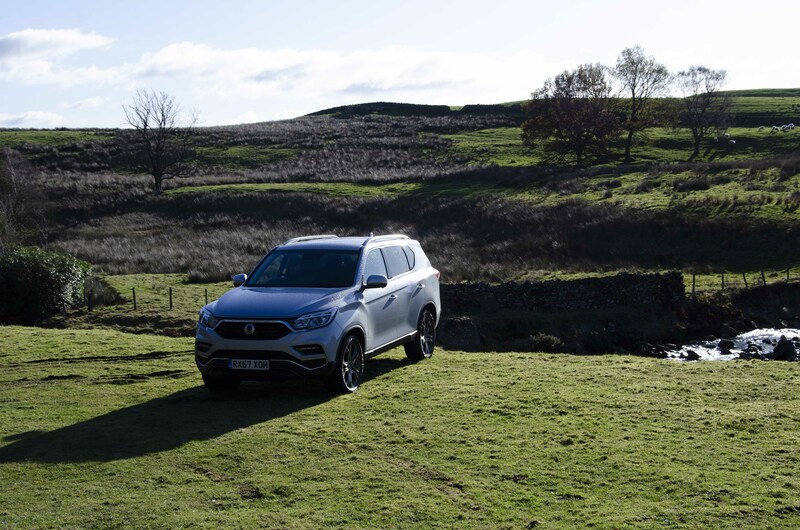 Pricing for the new Turismo kicks off at £20,495 for EX models, with the all-singing ELX beginning at £26,995. 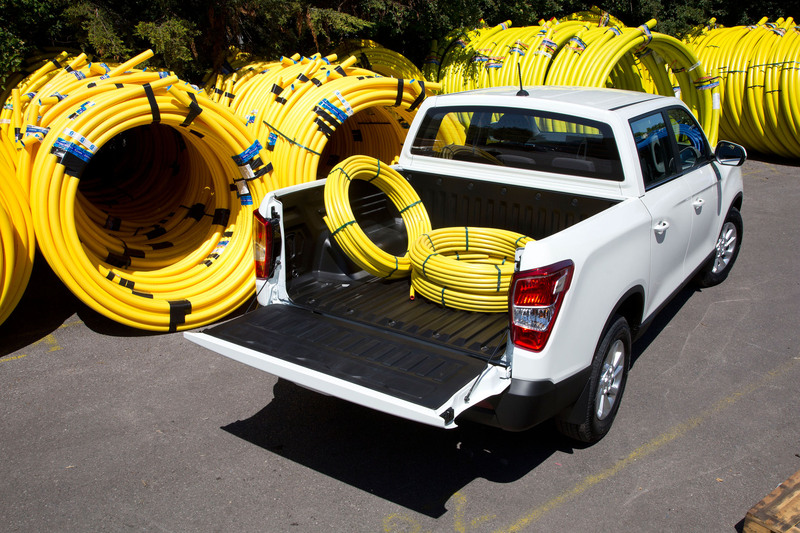 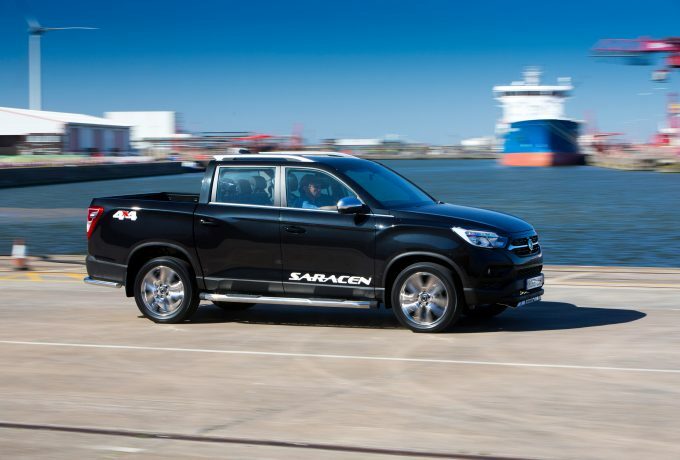 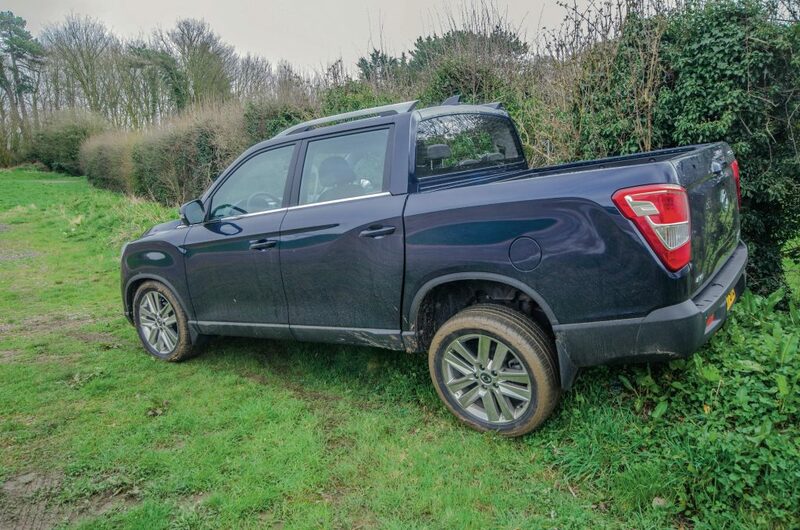 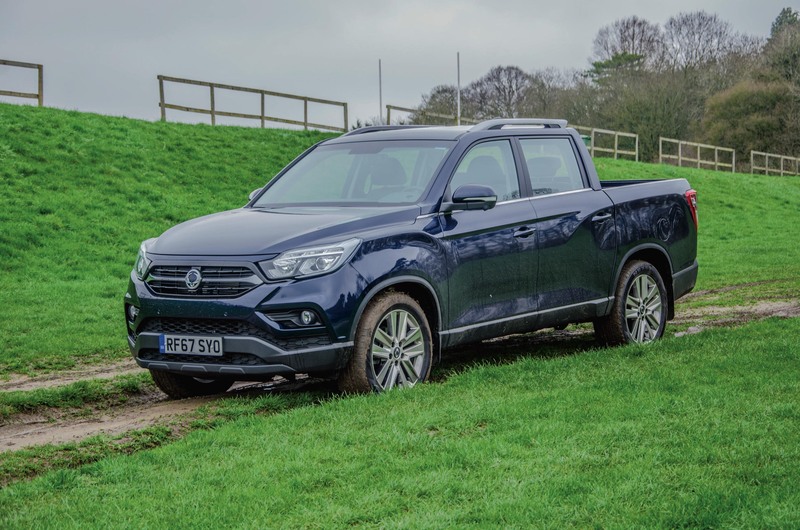 SsangYong have released extended details of the new Musso pick-up as it goes on sale in the UK, with a seven year warranty, four models to chose from and space for a euro pallet in the truck bed. 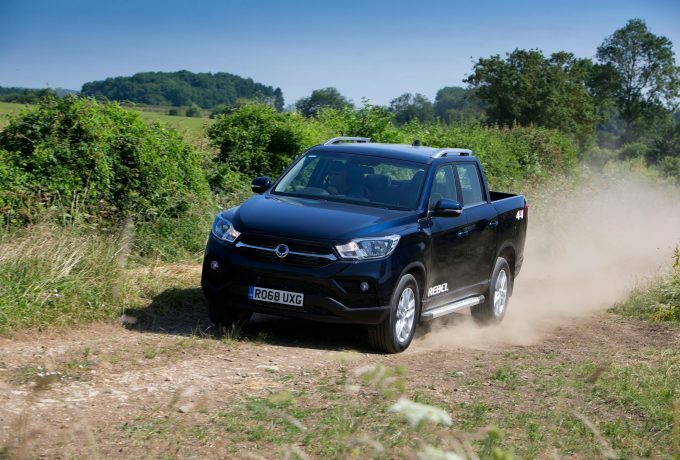 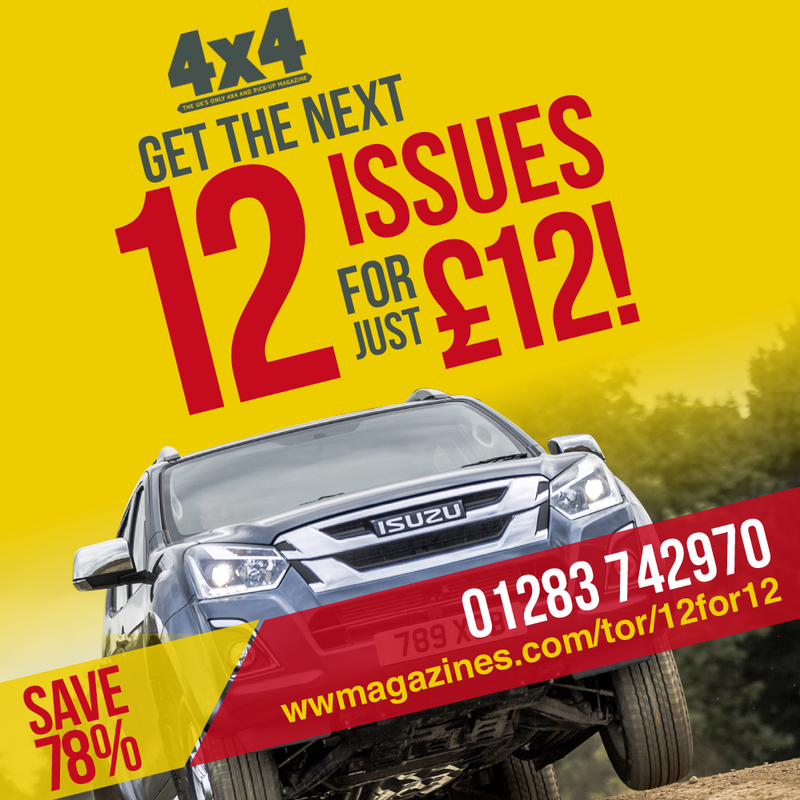 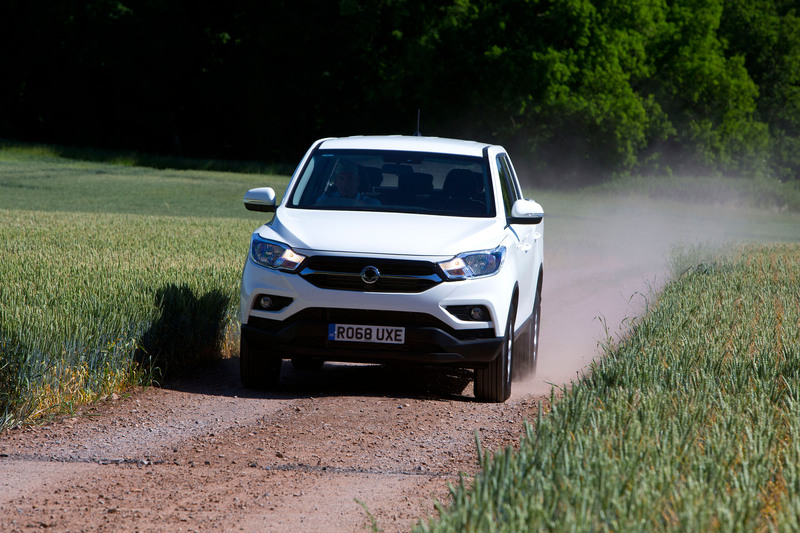 Based on our reigning 4×4 of The Year, the pick-up sits on a quad-frame construction, and uses the same 4×4 system and 2.2-litre diesel engine as the Rexton, providing 179bhp and 295lbf.ft through either a manual or Aisin automatic six-speed gearbox. The bed comes with hooks already fitted for tying down cargo, and has a payload of over a tonne. 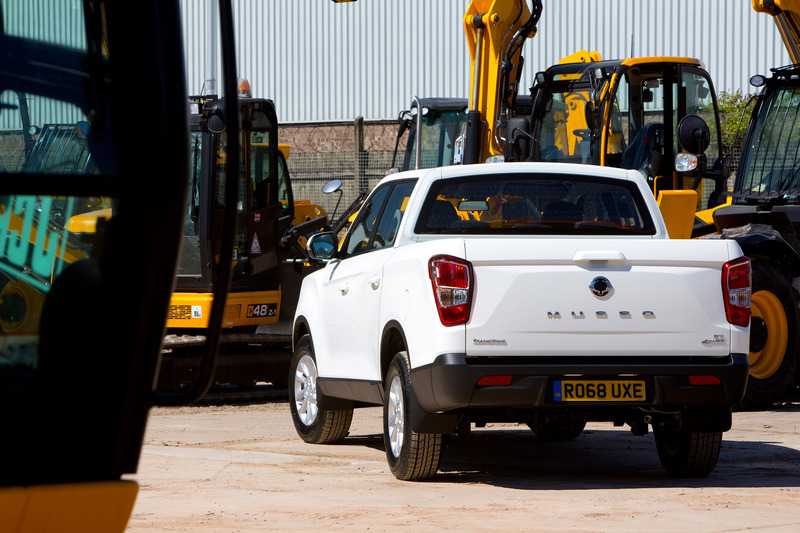 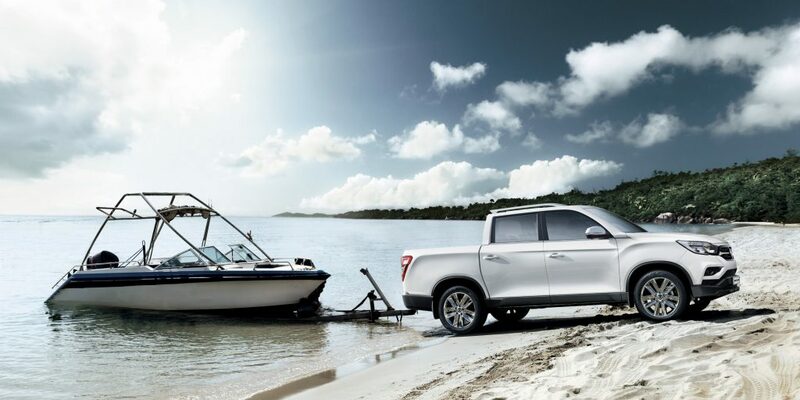 In a rather jaw-dropping stat the Musso can fulfil both the one tonne payload and its 3.5-tonne towing capacity at the same time. 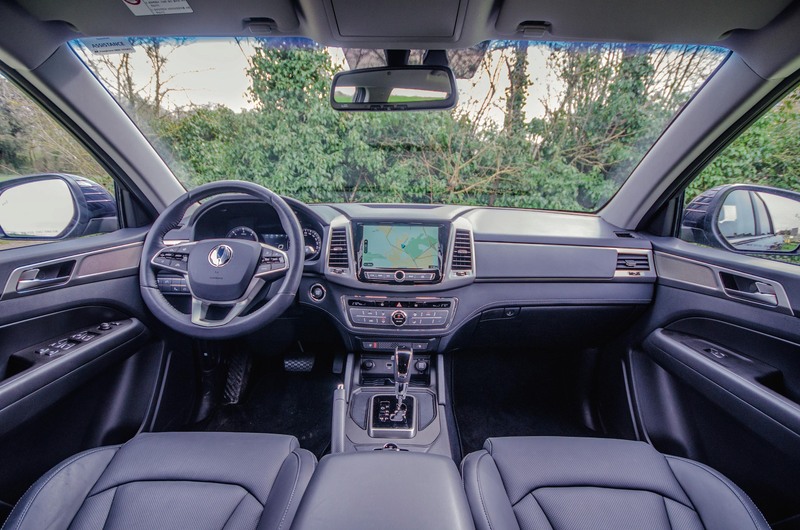 Inside, there’s plenty of space, and DAB radio and an eight-inch touchscreen with mobile connectivity feature across much of the range, whilst nappa leather and a 9.2-inch touchscreen with TomTom navigation can be found on top-spec models. 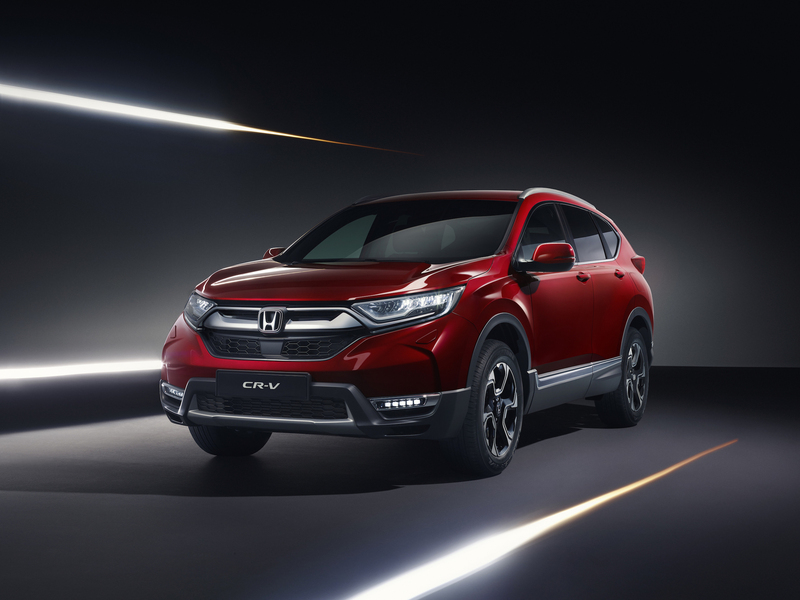 Entry level EX is a work focused trim, with 17-inch alloys, manual air-conditioning and automatic headlights and windscreen wipers. 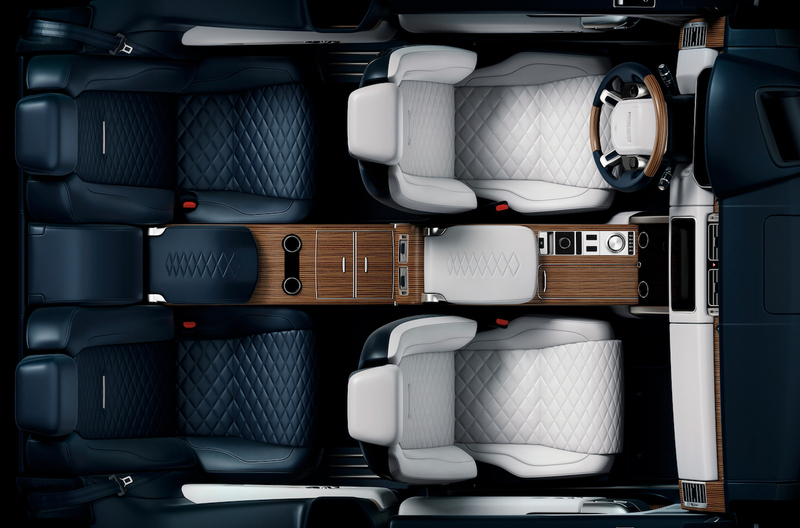 It gets DAB radio and bluetooth – but no touchscreen. 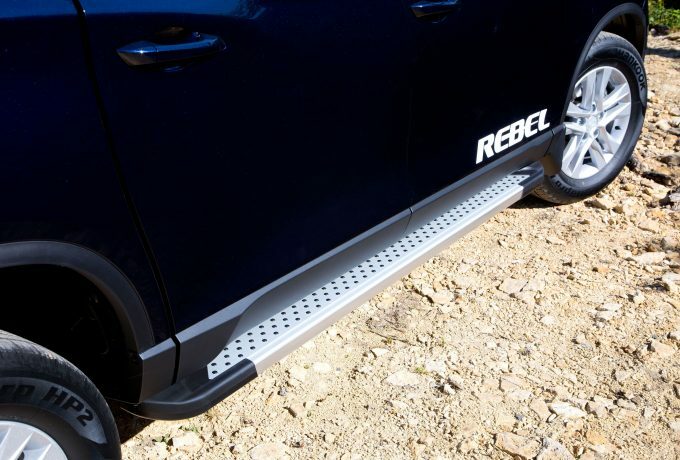 Rebel spec adds an inch to the alloys, plus roof rails, floor mats, the eight-inch touchscreen and a reversing camera. 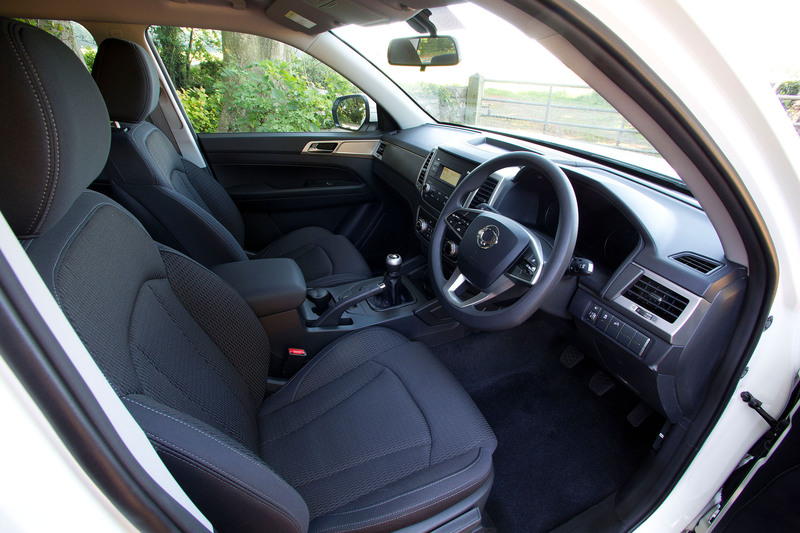 Leather-look seats are fitted, and in the front they are both heated and ventilated. 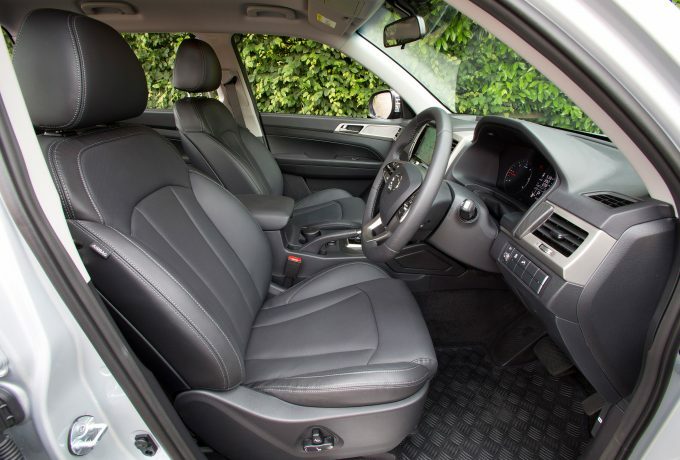 The leather steering wheel is heated and the black side steps and Rebel graphics distinguish the exterior styling. 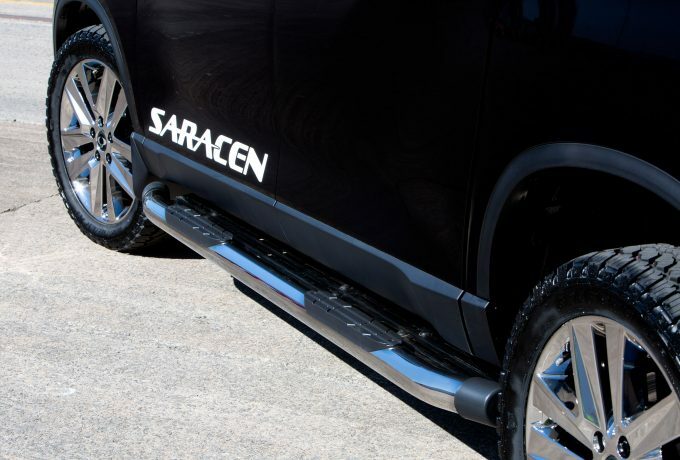 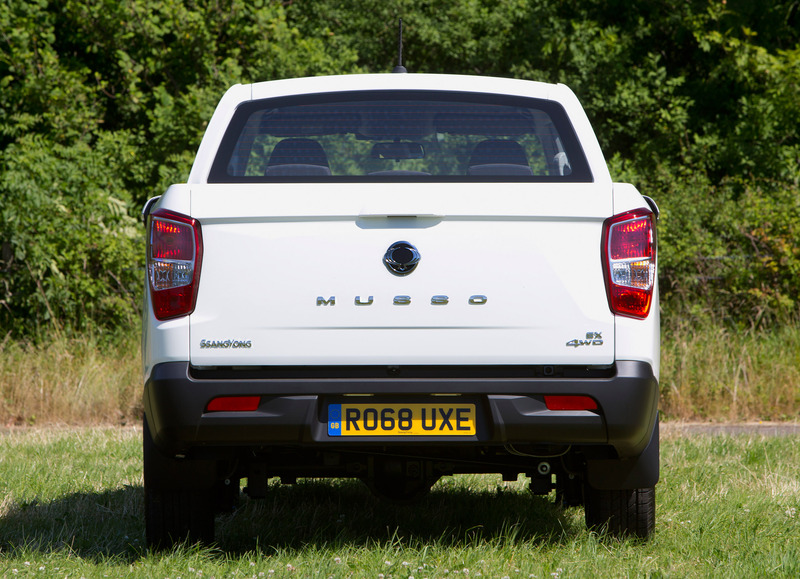 The Musso Saracen offers a more premium feel, with nappa leather seating, heated in the fron and back. 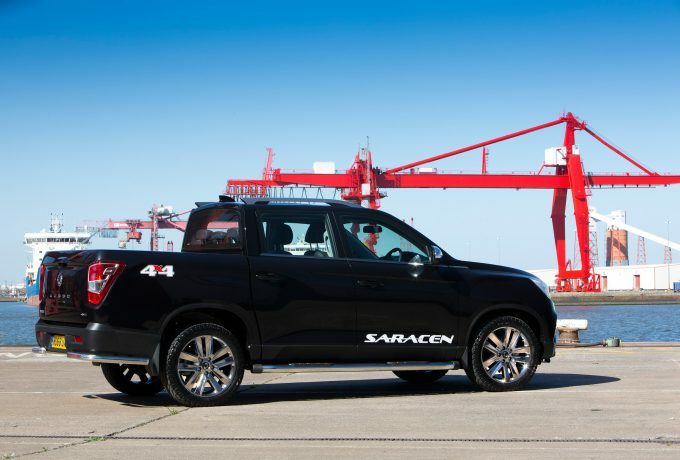 The bigger touchscreen comes into play in this spec, as do automatic LED lights, cruise control, and a front skidplate, bright rear corner bars, mirrors and door handles accompany the Saracen lettering on the outside. 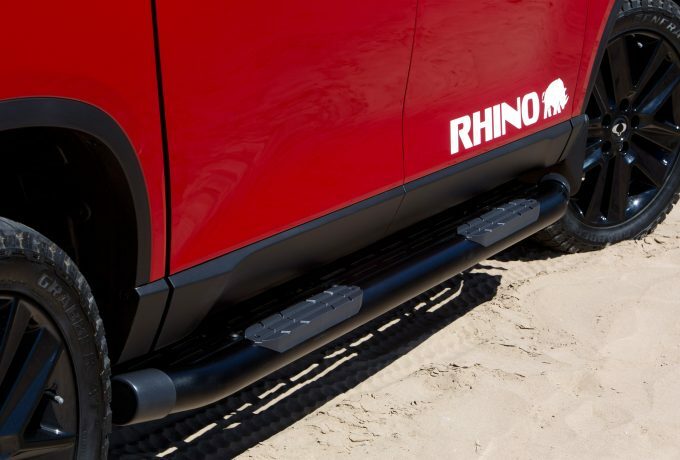 Topping the range is the Rhino – which is limited to 100 trucks. 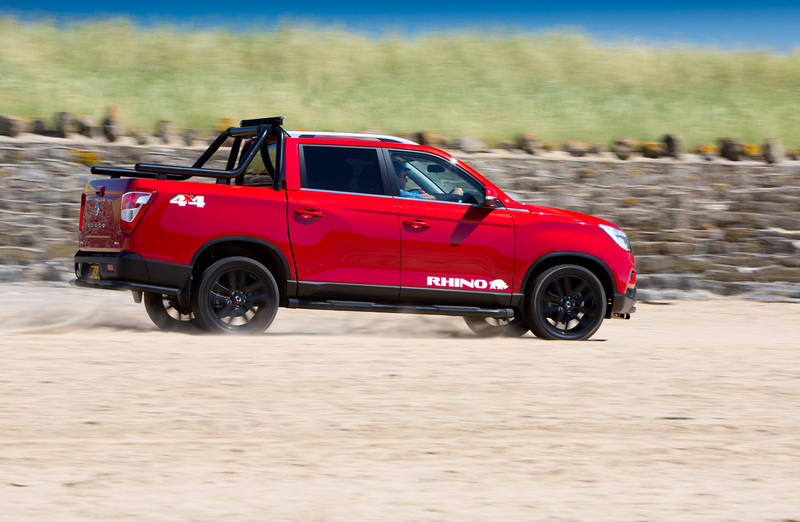 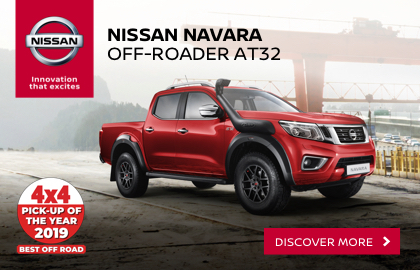 The special launch edition is finished in red or black, exclusively features the Aisin automatic ‘box and see the skidplate, now 20-inch alloys, tubular side steps and rear corner bars blacked out. 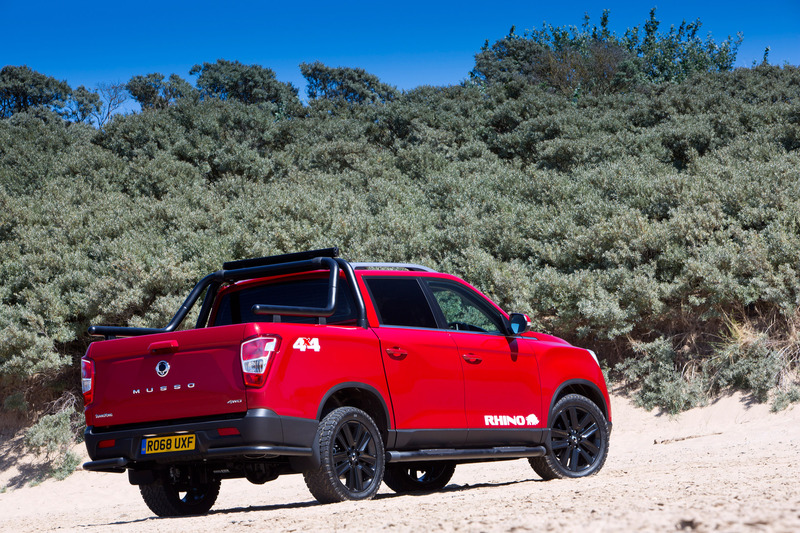 Tyres are upgraded to General Grabber all-terrains, and privacy glass fills the rear windows. Pricing starts at £19,995 with EX models, rises to £22,495 for Rebel spec, £25,995 for Saracen and Rhino models will cost £28,495 – all excluding VAT. 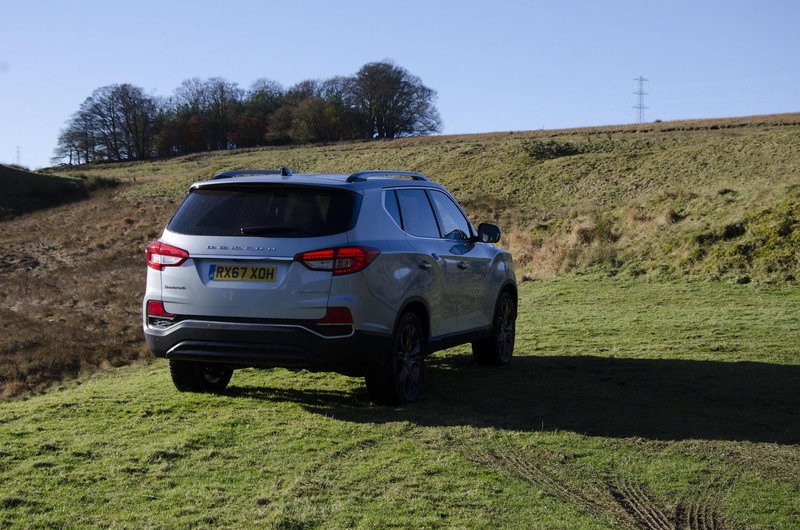 The new Musso is on sale now, and the only cost options are £1,250 for the Aisin six-speed auto ‘box and £430 for metallic paint options. 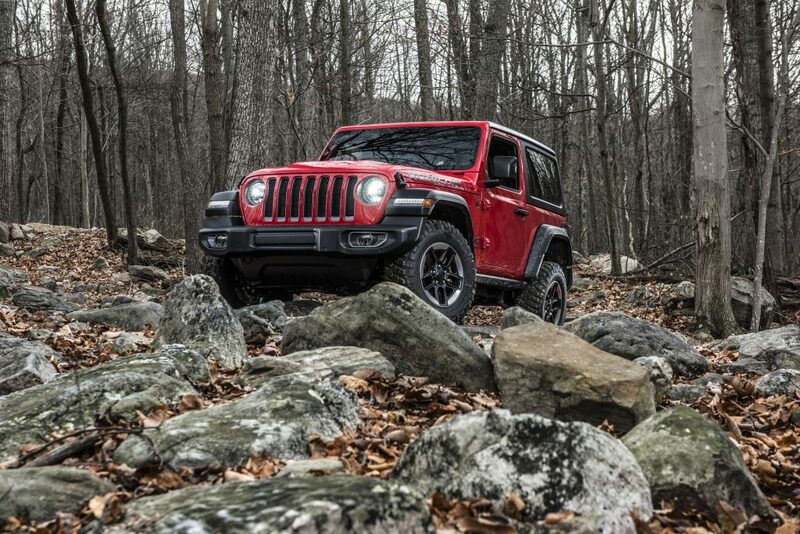 All models come with a seven-year/150,000 mile warranty. 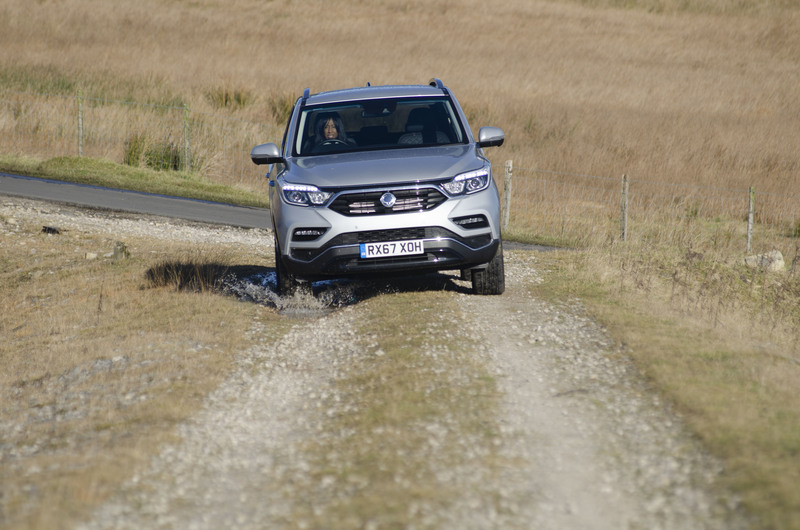 We got behind the wheel of a Korean-spec model in the last issue, click here to read our thoughts. It also comes with a five-year, unlimited-mileage warranty, and with running costs mattering so much to most people that could go a long way to convincing some buyers. So too could prices which SsangYong says will start at less than £20,000 plus VAT – these are yet to be confirmed, as has the exact spec of the three-strong UK range. 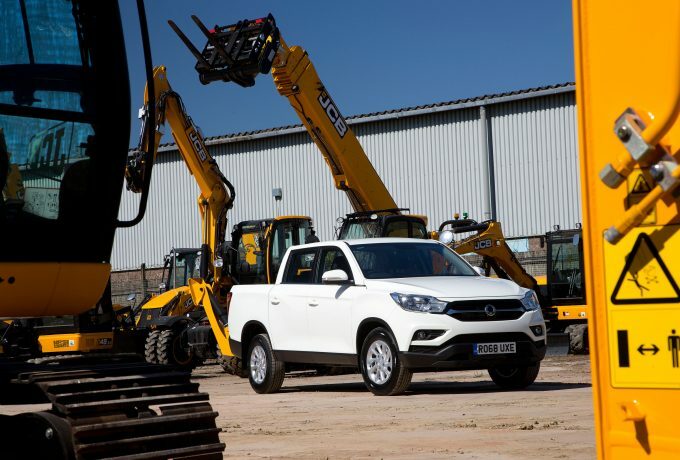 But it’s clear that value for money will continue to be a key part of the proposition. 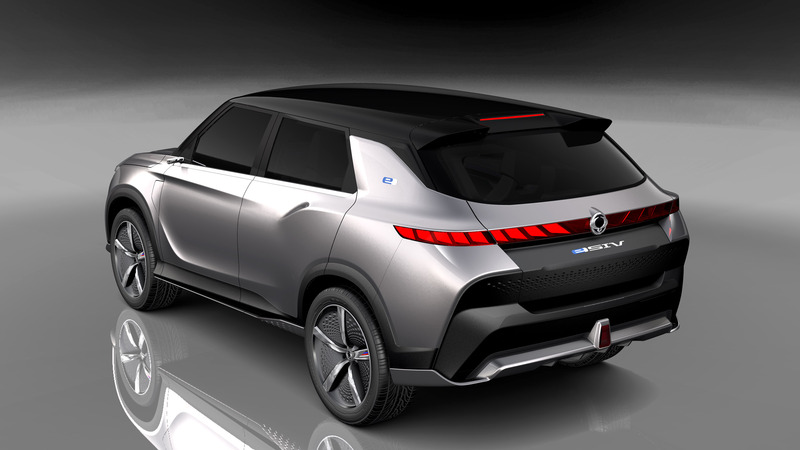 SsangYong have shown their e-SIV concept in Switzerland. 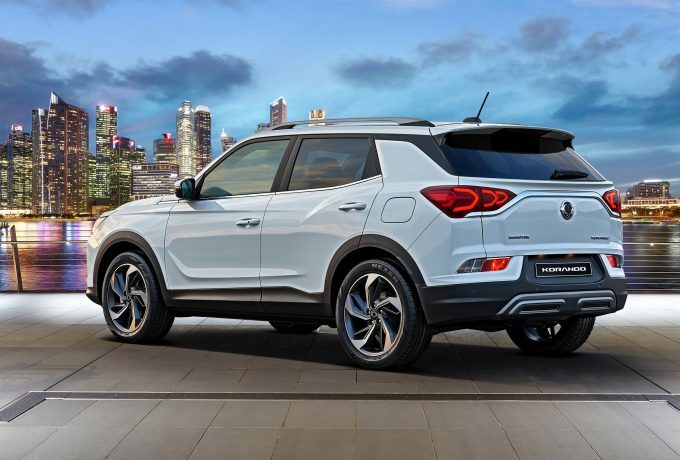 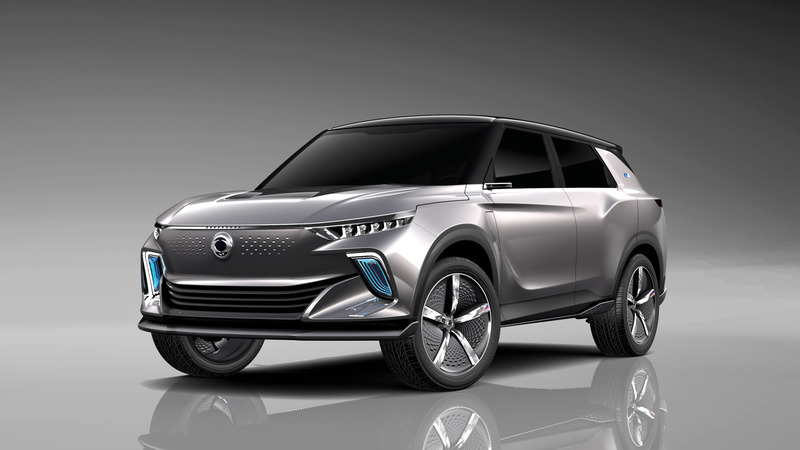 The SUV is the fifth electric concept SsangYong have produced, and aims to combine efficiency, driving capability and an advanced approach to connectivity. 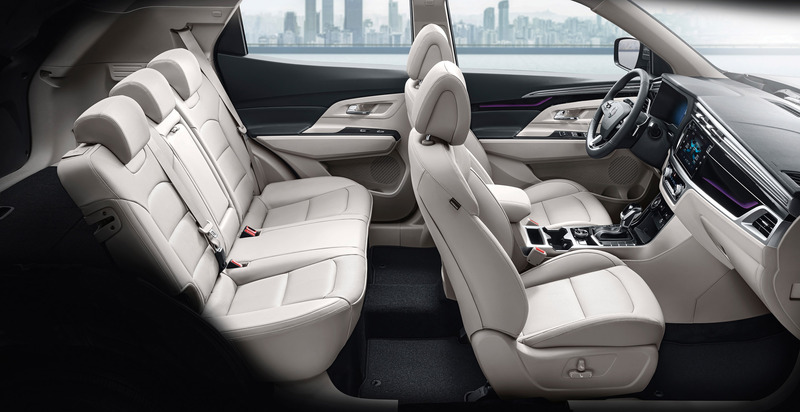 e-SIV stands for ‘electronic smart interface vehicle’, and the interior is aimed at ‘busy people’ and works with modern technology to become a ‘mobile communication space’. 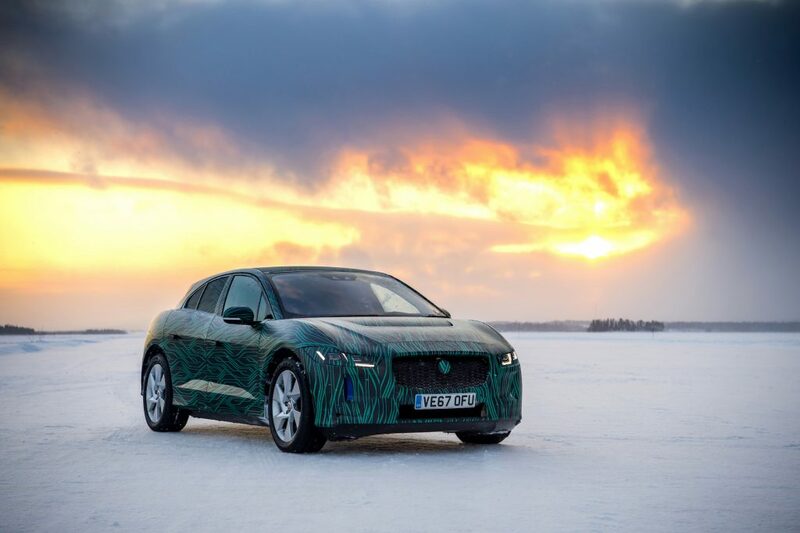 This will be achieved via a learning voice recognition system, internet connectivity and autonomous driving ability. Aspects ranging from charging, infotainment and in emergency conditions even driving the vehicle could be controlled via a smartphone app. 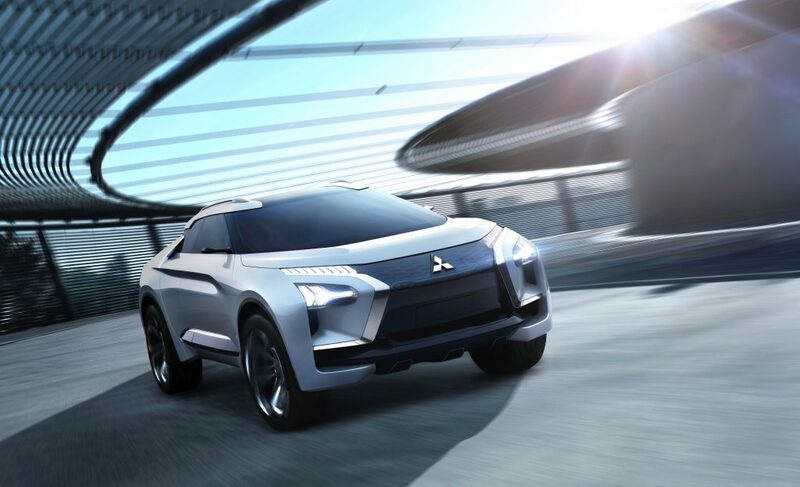 The e-SIV would have a cruising range of up to 450km, and charging will take the battery from flat to 80% in fifty minutes. 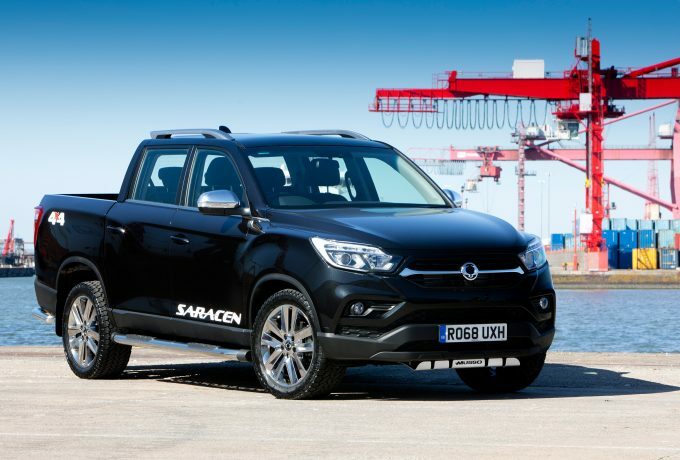 The new SsangYong Musso pick-up has been revealed at the Geneva Motor Show. 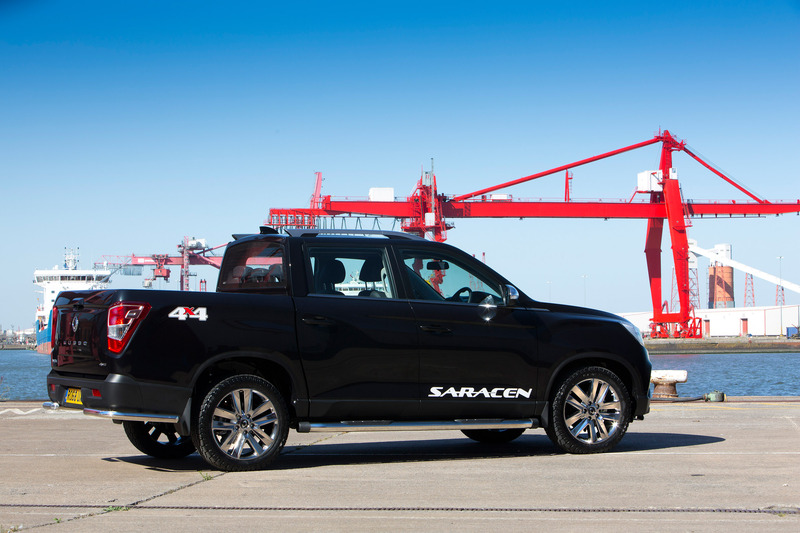 The Korean marque’s rugged new pick-up has a body-on-frame assembly and is built on the same platform as their current Rexton – which won our 4×4 Of The Year title. 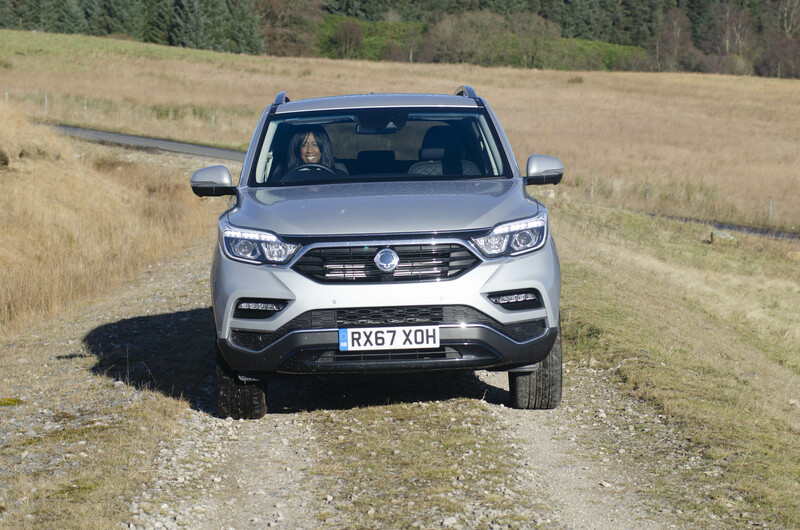 It also has SsangYong’s e-XDi220 2.2-litre diesel with 181bhp and 309lbf.ft – that has already impressed us in the Rexton and the smaller Korando. 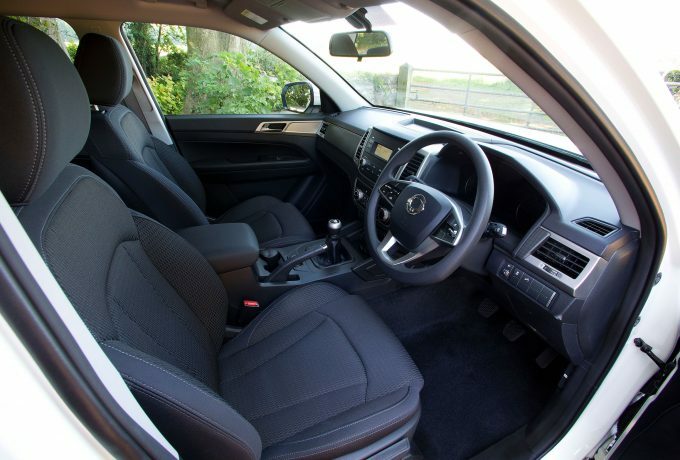 It gets the choice of six-speed manual or automatic transmissions, and part-time all-wheel drive comes as standard. 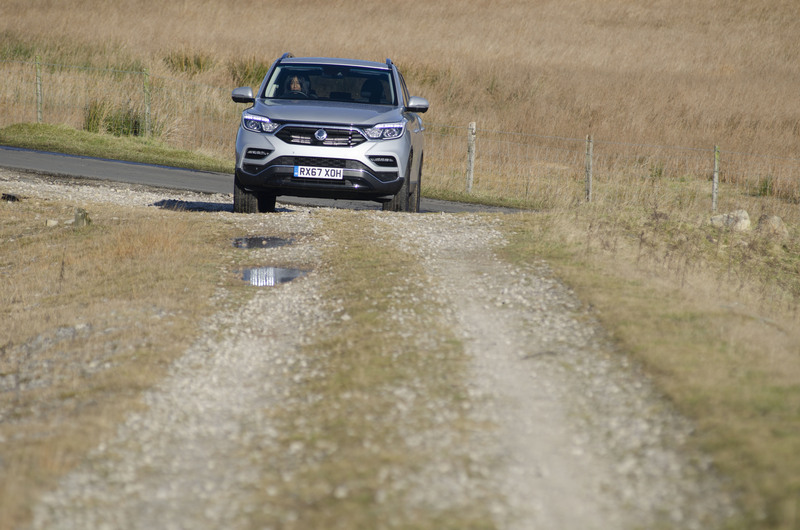 So too does high and low ratio boxes, promising off-road prowess akin to that of the Rexton. 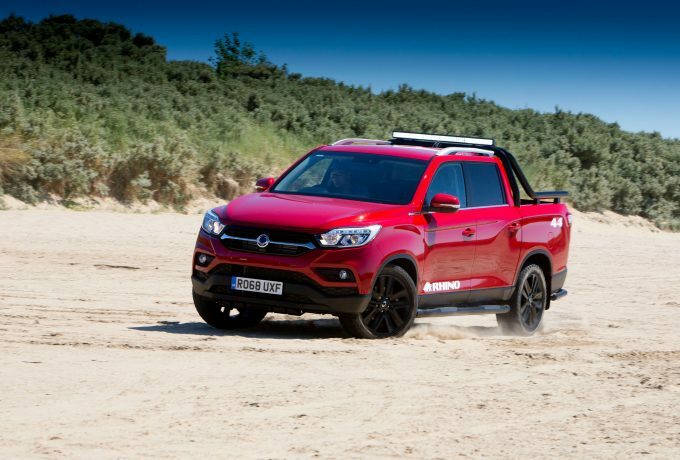 Eight-point body mounts and wheel-arch linings are in place to add sophistication to the pick-up, making the cabin quieter and more comfortable. 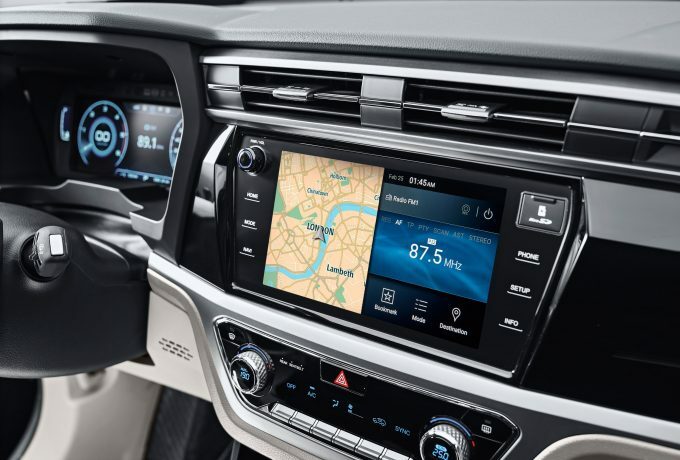 Bluetooth and DAB radio are present across the range, whilst an 8″ infotainment screen, Apple CarPlay and Android Auto and wi-fi mirroring are available on higher spec models. 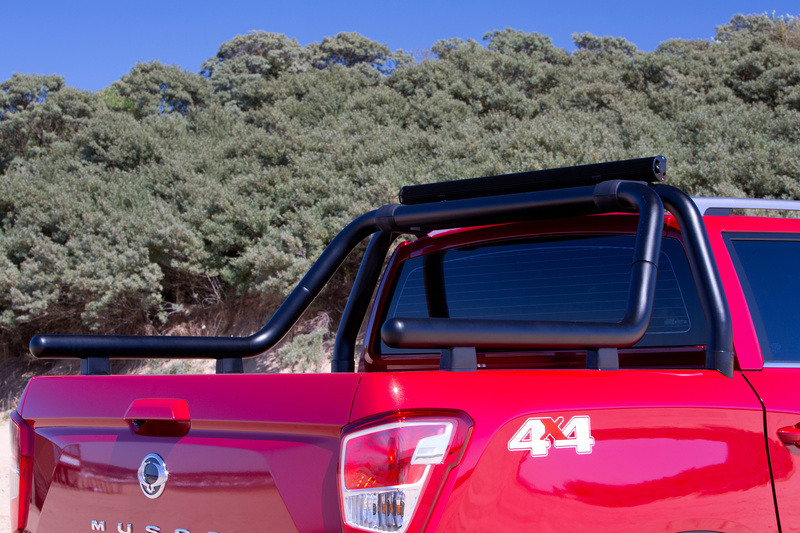 The pick-up bed is sized to carry a Euro pallet, and houses 12V/120W power outlets, plus rotating hooks to help when strapping cargo down. 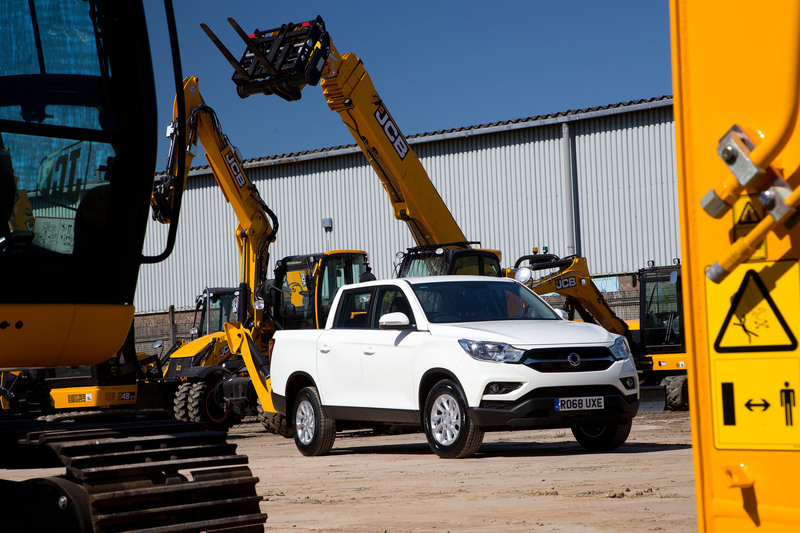 The manual can tow a braked trailer of 2,800kg, whilst the automatic can tow 200kg more, and both can haul an unbraked trailer of 750kg. 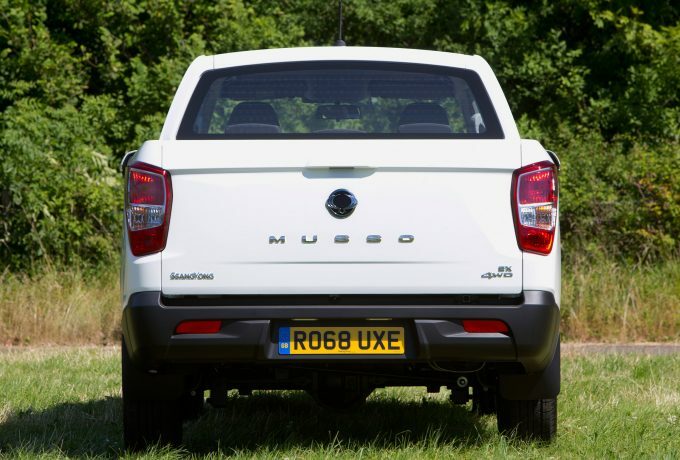 Specifications for the UK are yet to be announced, but the new Musso is expected to go on sale this summer.